Computer literacy is increasingly seen as an essential skill for children. But what is the best age to introduce them to computers and does it give them a head-start? There are plenty of so-called "kids computers" on the market, aimed primarily at the "three years and over" market. Most of them offer educational games and interaction but no internet connection. The benefit is that they introduce your child to a keyboard and a feeling they have a direct influence over their environment. Every Saturday morning at a north London school, a class meets to hone their computer skills and prepare for upcoming exams. The oldest child is seven years old and the youngest is four and a recent class had children learning how to input data into a Microsoft Excel spreadsheet. The young age of the participants and the complexity of the tasks they are performing raises questions about the use of computers by children. Teacher Mike Ryde says: "We have children as young as 18 months on the courses. "I must admit, though, a lot of those children tend to use computers in only a very small part of the lesson, it's not normally the major part of the lesson. "But normally by about 18 months to two-and-a-half-years we're having a lot of children starting to use the keyboard and mouse." Worldwide research on very young children and their use of IT is limited, but one recent report from Sheffield University in the UK called Digital Beginnings makes for interesting reading. ChiCI's Janet Read says: "My own opinion is that 18 months isn't a good age. "It's a little bit ridiculous to think of an 18-month-old child sat in front of a traditional computer. "That's not to say there might not be technologies that are adapted to them in the future, but the traditional keyboard, box, monitor and mouse doesn't seem to fit a child very well." So where do the techno tots like to go online? Not surprisingly, the most popular sites are based on children's TV shows. 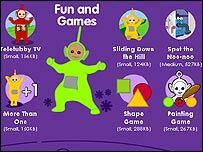 Many offer the opportunity to play games with different levels of difficulty, watch video clips, interact with a story or print out your favourite character. BBC Cbeebies online producer Olivia Dickinson says: "They use fine motor skills when they use the mouse or keyboard. So they can go up to using the spacebar, to using the arrow keys, to using the mouse. "They also learn some gross motor skills, in terms of some of the bigger movements of the mouse, but also in terms of physical development, when we give them activities to do in front of the computer, like dance and music. "We've got a few games where if you keep hitting the spacebar the Teletubbies appear, and that just gets them into what a computer is." 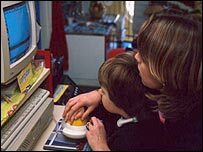 If your child starts to use a computer around two or three, does it mean they will do better at school? Mike Ryde says a group of six and seven year olds have already taken an information and communications technology GCSE. He says: "90% of those children had started when they were 18 months to two-and-a-half-years-old." Janet Read says: "I wouldn't say that children who use computers would definitely get a head start. "Some of these children would have been pushed in front of a computer like they would be pushed in front of a TV and so they're getting either the wrong sort of stimulation or no stimulation of any value, because it's quite easy to be entertained on a computer and not necessarily gain any value." There has been a lot of debate recently about keeping kids safe online, and the earlier children start to use computers the earlier parents need to think about protecting them. Microsoft has completely revamped its parental controls on forthcoming operating system Vista to make it easier to limit and monitor your child's online activities. Users will be able to specify exact days and times of access, block specific content and file downloads, set rating limits on games and print out an activity report which tells you exactly what your little angels have been up to. Symantec's Enrique Salem says: "It's a dangerous world out there. You really are in a situation where you don't know who that other person is. "There are many incidents that have happened where somebody has been lured to take some kind of action. I've got two kids, I'm not interested in my kid interacting with some freak on the other end of an IM [Instant Messaging] session."